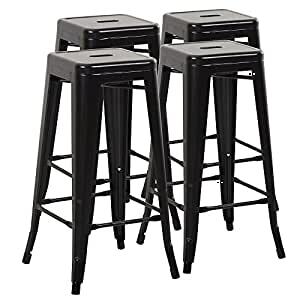 Mimo Living bar stool is perfect for bar, cafe, restaurant, in-home lounge, patio, dinning room and select this stool is modern, comfortable and firm to deliver commercial-grade durability and attractive style. Arriving fully assembled, this stool has a X-brace under the seat that provides additional support and stability. It also includes non-marking feet caps to protect your floor without leaving scratches or dents. The stool is built in electroplated metal for astounding durability. For outdoors, It can withstand the odd rain shower. With tapering legs, this chair is easy to stack and store.